1). Haridwar: - Haridwar is well known place in Uttarakhand. And it is also known as holiest and very sacred place in India. And every six and twelve year the biggest fair of India “Kumbh Mela” is also organized here. Population of Haridwar is highest in Uttarakhand. Haridwar is well connected through railways and roads transport from other major cities and states. Haridwar is always a best place for worshiped. 2). Dehradun: - Dehradun is also well known place in India. Dehradun is rail-head in Uttarakhand. Dehradun is well known for many universities. FRI (Forest research Institute) and university of Petroleum is also in Dehradun. Dehradun is Capital of Uttarakhand. 3). Tehri Garhwal: - Tehri Garhwal is well known for the largest water DAM in Asia. The language of Tehri Garhwal is Garhwali. Chamba, Dhanolti and many other famous hill station are also comes in Tehri District. 4). Uttarkashi: - Uttarkashi is a hill station in Uttarakhand. The area of Uttarkashi district is largest amongst all the districts in Uttarakhand. The Gangotri Dham is also comes in Uttarkashi District. 5). Pauri Garhwal: - Pauri Garhwal is also hill station and hilly area district of Uttarakhand. The Central University (HNB Garhwal university) is also comes in the Pauri Garhwal districts. Local language of Pauri Garhwal is Garhwali. 6). 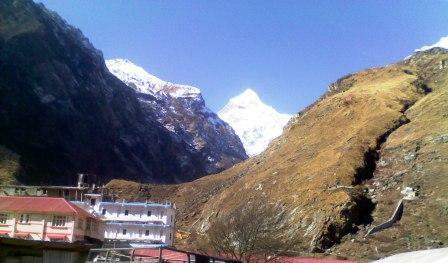 Rudraprayag: - Rudraprayag is situated at the height of 610mts above from the sea level. Rudraprayag is well known for the confluence of the Rivers Mandakini and Alaknanda. Local language of Rudraprayag is Garhwali. 7). Chamoli: - Chamoli is well known for many places of Interest like Valley of Flowers, Shri Badrinath Dham, Auli, Hemkund Sahib and many other beautiful places. After the Chamoli district Kumaon region is start. Local language of the district is Garhwali. 8). Bageshwar: - Bageshwar is a very sacred place in Kumaon region. There are many of Hindus goddess temple is in the Bageshwar. Local language of the district is Kumauni. 9). Almora: - Almora is an amazing hill station in Uttarakhand. You can see here the amazing views of Himalayan peaks. Local language of the district is Kumauni. 10).Pithoragarh: - Pithoragarh is well known for the amazing peak “Om Parvat”. The Nepal border is also divided from Pithoragarh District. Local language is Kumauni. 11). Champawat: - Champawat is also a hilly area district in Uttarakhand. Local language of the district is Kumauni. 12). Nainital: - Nainital is also a well known place in India. It is also known as lake capital of India. Local language of Nainital is Kumauni, Hindi. 13). Udham Singh Nagar: - The thirteenth district is Udham singh Nagar, it is comes in the Plain area in the Uttarakhand, local language of the district is Hindi. For any types of query regarding this post kindly tell to us.